A screenshot from the "Stop Jihadism" video from the French government. The video with the hashtag #StopJihadism was published in a bid to counter calls to join extremist groups in the Middle East, including the Islamic State militants who are rampaging through parts of Syria and Iraq. The beginning of the video shows popular jihadist groups on social media and an anonymous invite to join the terrorists saying “the truth is out there and now is the time to go... if you want more info just give me your number..."
It then goes on to explain the difference between what the jihadists say about joining them and what the reality is. 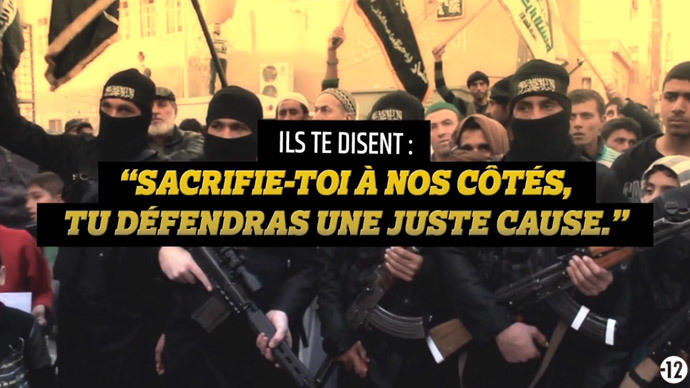 "They told you: "Sacrifice yourself by our side for a just cause," the message in French says. "In reality, you'll find hell on earth and you'll die alone, far from home." The text is accompanied by footage of people killed and their bodies dumped. "They tell you: Come and start a family with one of our heroes,” while the government says that actually: "You'll bring your children up in the midst of war and in terror." In the framework of the campaign the French government also established an anti-terror hotline. The launch of the anti-terror website follows a statement by Prime Minister Manuel Valls last week announcing a new series of measures aimed at preventing further terror attacks. The €425 million anti-terror plan includes nearly 2,800 jobs to monitor 3,000 potentially dangerous individuals in France, according to Valls. “The number of radicals in the country is constantly growing. French intelligence needs to conduct surveillance on over 3,000 radical Islamists. In particular, 450 people who have previously participated in fighting in Pakistan, Afghanistan and Yemen, and at the moment are taking part in sending volunteers to Syria and Iraq - they account for about 1,300 people,” Valls said last Wednesday .